As a growing creative startup, finding a place to work and build in a rapidly growing city can be a challenge often overlooked. After working out of our home for over two years at The Commons on Champa we were ready for some growth into a space where we could work and build. We still love The Commons and visit, hold events, or work there often. Searching for something at the scale we needed for the price we could afford was proving to be difficult. After scouring the market for a couple months our good friends at TVL Creative let us in on their secret. They rented a space in an artist, maker, and creative workspace called Prism Workspaces. This conglomeration of a couple buildings sits on the outskirts of downtown just south of Mile High Stadium in an industrial park just a gust of wind away smells of greenhouses full of Colorado’s cash crop. 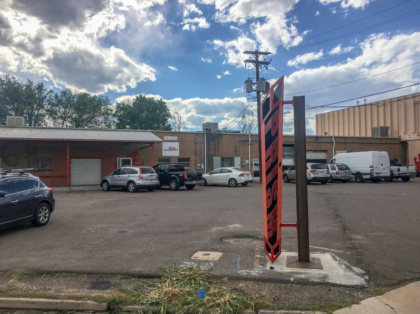 The unassuming warehouse style buildings contain a labyrinth of workspaces for some of the most phenomenal creatives in Denver. We moved into Prism in October of 2017 into a 1300 sq. foot unit for a fraction of the price of other spaces we had been looking at. Apart from the size, location, and price what has really excited me was the community and the passion people had for the work they did. Day in and day out the noises from people building, and making things fills the air at Prism reminding us of the creative energy flowing heavily through the space. In the social and political climate since the Ghost Ship fire, creative spaces have been uprooted in many places around the country. Makers, creatives, inventors, artists, and musicians have been reeling to find places to live and work since their displacement. The tragedy rocked the community and has touched many of our lives so very deeply. Preventing something like that happening again is certainly important however the implementation of the enforcement has caused a lot of discomfort and even suffering among people in our community. Although Prism doesn’t solve any of the housing issues, the feeling of the DIY community workspace seems to thrive, while also maintaining a healthy relationship with the City. The synthesis of professionalism and creativity shouldn’t be feared, and the feeling of the community can still flourish. Our office inside of Prism. After almost 8 months, we have really found a home at Prism. Our office and studio space allows for us to work together in a space we can be proud of. With ample space for desks and individual workspaces paired with a great meeting area and a large fabrication and build space, we have a natural and efficient flow to get a good volume of quality work built and designed. 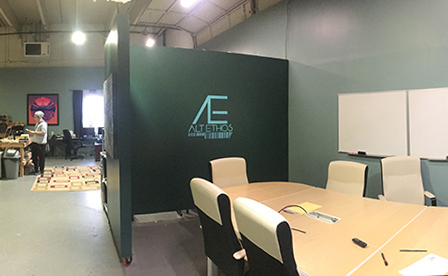 We have ample space to build out installations for testing or prototyping before we deploy final products. Welcome to the Alt Ethos interactive installation factory. Coming up 7 months after our first open house not long after we moved in, the Prism Community is hosting another open house. We are so excited to show you what we have been working on the past half of the year. Please come by and see what we have in store for this event and also check out what our neighbors will have to show. The theme of this open house is Ultraviolet, so expect a lot of purple! Come celebrate with us at the Prism Workplaces facility-wide open house to take in the work of talented artists, designers, and creatives. We are grateful to be a part of this community as we continue to expand our organizations into new possibilities. The open house will be held on Friday, June 1st, 2018 from 5:30pm to 11:30pm at Prism Workplaces 999 Vallejo Street, Denver Colorado. 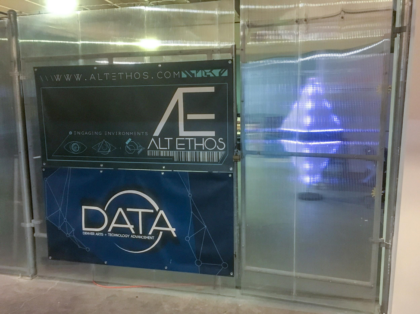 Alt Ethos is located through entrance 2 at space #30.